Investigators at the University of Illinois recently described their new method to detect, count, and map DNA methylation sites, a potential warning sign of cancer, with unprecedented resolution. The researchers are optimistic that their findings will lead to early detection of cancer, just as changes are beginning in DNA, ultimately enhancing diagnosis and treatment, as well as further our understanding of the disease. The findings from the new study—published recently in npj 2D Materials and Applications through an article entitled “Detection and mapping of DNA methylation with 2D material nanopores”—describes a method that threads DNA strands through a nanopore in an atomically thin sheet of material with an electrical current running through it. 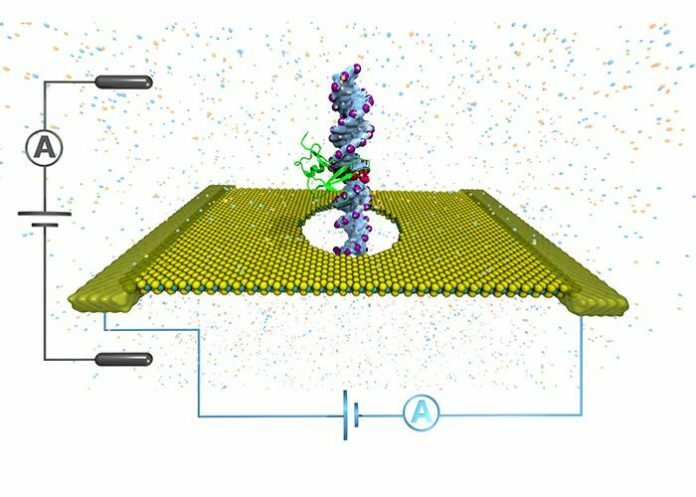 Nanopore sequencing represents cutting-edge DNA technology that has been gaining interest in recent years. Previous attempts at using nanopores to detect methylation, however, have been limited in resolution. Researchers begin by punching a tiny hole in a flat sheet of material only one atom or molecule thick. The pore is submerged in a salt solution, and an electrical current is applied to drive the DNA molecule through the pore. Dips in the current alert researchers that a methyl group is passing through. Yet, when two or three are close together, the pore interprets it as one signal. In the current study, the Illinois researchers tried a slightly different approach. They applied a current directly to the conductive sheet surrounding the pore. Moreover, the scientists utilized advanced computer simulations to test the application of current to different flat materials, such as graphene and molybdenum disulfide, as methylated DNA was threaded through. The researchers were excited by their findings and are currently working with collaborators to improve DNA threading, to cut down on noise in the electrical signal and to perform experiments to verify their simulations.